I wish I started my collection of midi skirts much earlier on. After all, there's a feminine, vintage vibe about midi skirts that is right up my alley. They are also extremely versatile and can be dressed up or down depending on what tickles your fancy. I've always had a soft spot for tulle skirts, and this tulle midi skirt from ClubCouture is like a dream come true for me. In a delicious shade of cream, this airy fairy skirt looks like it came right out of a fairytale. For a casual weekend look, I decided to amp up the vintage vibes and went for a nautical themed ensemble with a comfy blue striped t-shirt and quirky pink accessories for added contrast. 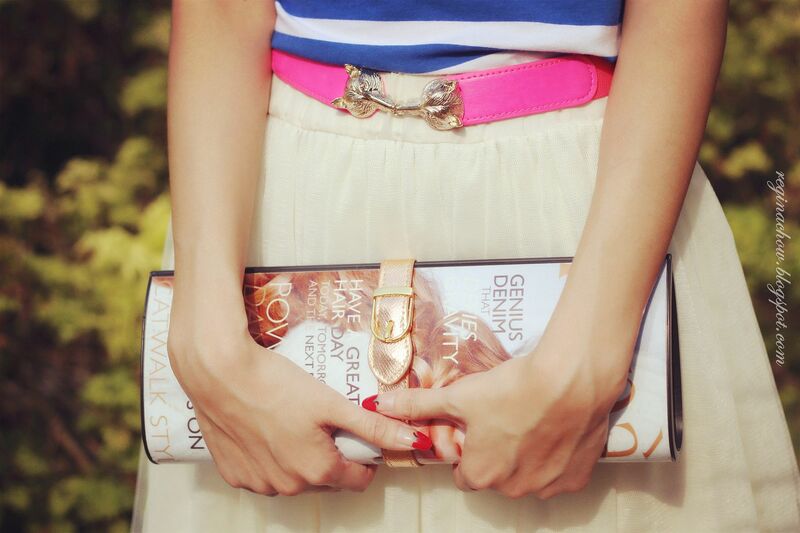 This whimsical magazine clutch from MyJotterBook (sorry to disappoint you, but this is no longer for sale!) completed the look and served as an instant conversation starter. JW takes all my outfit shots, and in this series of photos, he experimented with a new photography style, which resulted in a dreamier and more mysterious interpretation of my surroundings. I can think of so many other ways to style this lovely midi skirt, so if you are interested, do keep your eyes peeled for more outfit posts that will be coming your way in this humble space of mine. Meanwhile, have a good weekend ahead!